Irish Film London (IFL) is a not-for-profit organisation that champions Irish film, TV and animation in the UK with an annual festival and a year-round programme. IFL is seeking a reliable Administration and Communications Coordinator. The organisation is approaching its tenth anniversary of running the Irish Film Festival London. The IFFL is launched each year at the Irish Film London Awards ceremony, this year to be held at the Irish Embassy in London. IFL also runs events throughout the year, including the film section of the St. Patrick's Day Festival with the Mayor of London and the film section of the St. Brigid’s Festival with the Irish Embassy. Through premiere screenings, director Q&A sessions, related workshops, exhibitions and performances, the organisation brings together industry professionals, film fans and fans of Irish Arts & Culture. Focusing on Irish productions, scripts and casts, they provide an outstanding platform for Irish film in London and promote the best of Irish creative talent in the UK. The Coordinator will support the Director in the delivery of IFL’s projects and festivals. This role is freelance, on a £21K rate pro-rata for 2 days per week. Flexible working hours can be arranged, although attendance at most events will be necessary. Candidates will need to provide their own laptop. To apply for the role of Administration and Communications Coordinator, please send your CV and a covering letter outlining your reasons for applying and your suitability for the role to info@irishfilmfestivallondon.com by *5pm on Tuesday 23rd April 2019. We thank everyone who applies for their interest, but please note that only candidates selected for an interview will be contacted. All applications are considered confidential. Irish Film London is an equal opportunity employer. We are committed to accommodating people with disabilities and will work with applicants to meet their needs. *Please note we reserve the right to close the vacancy early in the case of a large response, so early application is highly advised. 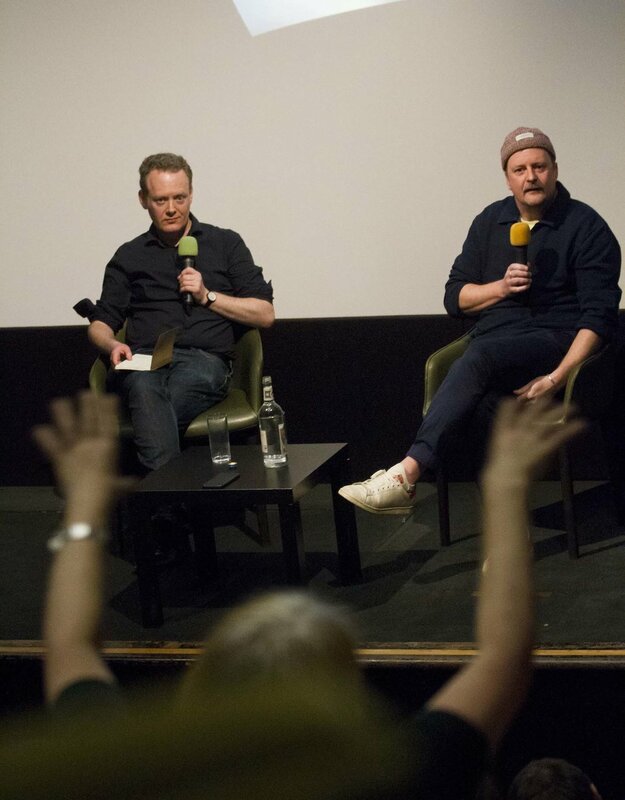 Check out our photos from the St. Patrick’s Film Festival London 2019, courtesy of Noel Mullen and Casper Knight. Featuring 3 days of films, workshops and networking. Click on an image to expand. The St. Patrick’s Film Festival London 2019 will take the Mayor of London Sadiq Khan’s ‘London is Open’ campaign as its inspiration, with a programme reflecting the spirit of diversity and inclusion in this great city. As Brexit approaches, many non-British people living in London are feeling unsettled, and Khan has said that he wants “all Londoners to be in no doubt: London Is Open and no matter where you’re from, you will always belong here." With this in mind the festival, which is presented by Irish Film London and forms part of London’s official St. Patrick’s Day Festival and Parade, brings together a collection of films celebrating outsiders, mavericks and the delightfully unique. Regent Street Cinema Programmer Shira MacLeod said, “It’s fantastic to once again join Irish Film London and the official St. Patrick's Day Festival with this weekend celebrating Irish film. We’re particularly pleased to be a part of the conversation about diversity and inclusion. At Regent Street Cinema, our ongoing programme reflects the great diversity of London and we are proud to host unique film festivals like this one." Events for all ages will be held over the course of the weekend, with the main Festival Programme being shown at the Regent Street Cinema, just a two-minute walk from Oxford Circus tube station. 6.30pm: Opening the festival is a collection of short films from Ireland, including Hugh O’Connor’s beautiful animation The Overcoat, which was voiced by Peaky Blinders’ Cillian Murphy. The film tells the story of a young outcast clerk who desperately seeks the approval of the popular office group by spending his every last penny on an impressive new overcoat, only to find it brings him more attention than he bargained for. The shorts programme also includes Ireland’s first ever vertical dance film Walls of Limerick, a statement on the psychological effects that harsh political borders have on people. The experimental short, which features versatile performers blending the worlds of dance and aerial dance, explores notions of barriers, borders and breaking loose. 8.15pm: John Butler (Handsome Devil, The Stag) once again delights with cross-cultural comedy drama Papi Chulo, starring Matt Bomer and Alejandro Patiño as unlikely companions. The film sees a lonely Los Angeles weather-man ‘hire’ a middle-aged Latino migrant worker to be his friend, in this darkly comedic reflection on class, ethnicity, and companionship in a busy contemporary world. 2.00pm: Family and unusual friendships are at the centre of Colin McIvor’s exciting film Zoo, based on a true story set in Belfast in 1941. It sees Young Tom and his misfit friends fight to save 'Buster' the baby elephant during the German air raid bombings of the city. 6.00pm: Take to the skies with a life-affirming documentary The Man Who Wanted to Fly. Capturing the wonder of one man’s dreams, the film tells the irresistible story of 80-something bachelor farmer Bobby Coote. He is determined to take flight. Even if it’s the last thing he does… Bobby is the perfect example of someone who sticks to his convictions, despite everyone’s preference, although well-meaning, for him to conform to a stereotype. Director Frank Shouldice will attend this screening to share his own experience of making the film. 12noon-6pm: Pop in to chat with the Irish Film London Team among the community stalls on Trafalgar Square. You will be able to check out the festival trailer live on The Big Screen in the square, while enjoying the live music, food, dance and festivities. Still from We Are the New ireland, featuring Irish musician Steven Sharpe. 6.30pm: After celebrations come to a close on Trafalgar Square, it’s back to Regent Street Cinema for the Festival Closing Night, with a final selection of Irish short films, including We Are the New Ireland, in which four Irish people explain what it is to be gay in Ireland today, framed by the music of Steven Sharpe. We are seeking expressions of interest from individuals for the position of Treasurer. The successful applicant will also join the board of Irish Film London Limited, the body responsible for setting the direction and strategy of the organisation. Check out a selection of photos from our 2018 Irish Film Festival London, which took place at the BFI, Barbican, Regent Street Cinema, Bertha Dochouse at Curzon Bloomsbury and The Union Soho 21st - 25th November 2018. The Irish Film London Awards 2018 took place at the Embassy of Ireland, Great Britain on Tues 13th November. They honoured outstanding Irish filmmakers. Check out the full line-up for the Irish Film Festival London 2018, with screenings and talks taking place across five days in five venues across London. Irish Film London is seeking a new board member with corporate sponsorship experience. Come and join our friendly team. The St. Patrick's Film Festival London returns to the UK Capital this March with 3 UK Premieres, Q&As, a workshop and a collection of Irish short films. London Film School & Prince Charles Cinema. Check out a selection of photos from our 2017 Irish Film Festival London, which took place at Picturehouse Central Grange Langham Hotel and Regent Street Cinema 29th Nov - 3rd Dec 2017. The Irish Film London Awards 2017 took place at the Embassy of Ireland, Great Britain on Thurs 16th November. They honoured outstanding Irish filmmakers. As part of the Mayor of London’s celebrations for St. Patrick’s Day, 23 Irish films will be screened across London venues. The Irish Film Festival London is delighted to announce 'A Date for Mad Mary' as this year’s opening night film on Weds 23rd November at Regent Street Cinema. Submissions for the 2016 Irish Film Festival London are now open. This year there are 4 Award categories. Submit via Film Freeway. The Irish Film Festival London is delighted to announce Lenny Abrahamson as our new Patron. The Irish Film Festival London has concluded for another successful year. Read on for all our Thank Yous! To get everyone warmed up for this year’s Irish Film Festival London, we ran a special treat! On Nov 3rd, Time Out Cardholders attended the Irish Film Festival London’s preview screening of ‘Brooklyn’ at the Tricycle Theatre. Directed by John Crowley. Eilis Lacey is a young woman who leaves the comfort of her mother’s home in Ireland for Brooklyn in 1952. But, after soon falling for an Italian-American man, she’s forced to consider a move back to Ireland when she learns of some devastating news. The film stars Saoirse Ronan (‘Atonement’, ‘Hanna’, ‘Grand Budapest Hotel’), Domhnall Gleeson (‘Star Wars’, ‘Frank’, ‘Harry Potter’, ‘Calvary’), Emory Cohen, Emily Bett Rickards, Julie Walters and Jim Broadbent, and is written by Colm Tóibín and Nick Hornby. This event was brought to you by Irish Film London, Time Out and Lionsgate. ‘Brooklyn’ is in cinemas from November 6. 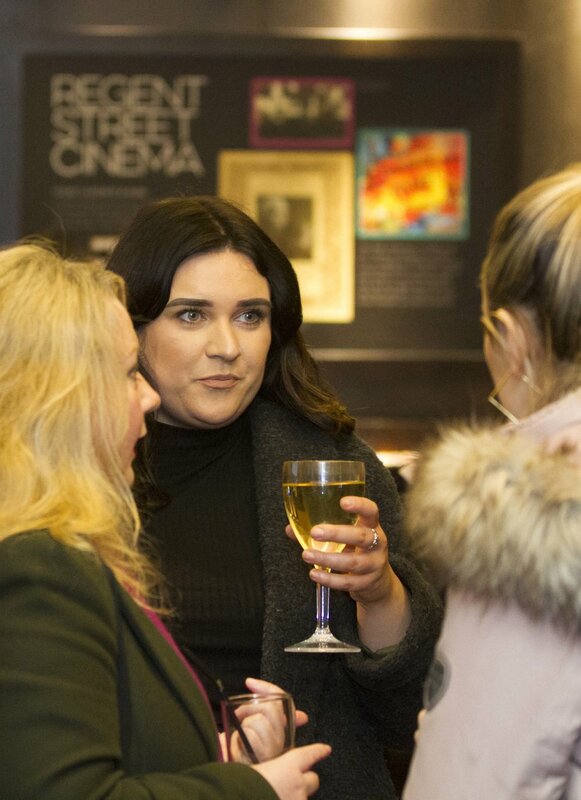 Check out the pics from our recent reception at Bentley’s, co-hosted with the Irish Film Board, to celebrate the Irish films being screened at the BFI London Film Festival 2015. All images courtesy of Noel Mullen. Producer Pippa Cross, Keith Potter of Irish Film Board, Geraldine Atlee of Channel 4 / Film4, producer Jonathan Taylor and film-maker Tracy Spottiswoode. Kathryn Bowe, International film events coordinator Eibh Collins, Angela Sammon and Mark McNulty of State Street Global Advisors Ltd.
Ronan O’Sullivan with the sound team behind the Lenny Abrahamson film Room are Shane Flanagan, Niall Brady and Ken Galvin, all from Ardmore Sound in Co. Wicklow. Ben Brass with film-maker Jamie Delaney and writer / producer Afolabi Kuti. Television director Kieron J Walsh with Iranian filmmaker Mohsen Makhmalbaf and his film-maker son Maysam Makhmalbaf. Producer Jonathan Taylor, producer Julie Baines, writer / director Aoife Crehan and Charlotte Knight. Ruairi Conneely from Ireland Fund of Great Britain with Mary Brehony and Pat O’Hara. Producer Conor Barry with Janine Marmot of Hot Property Films with Chief Executive of the Irish Film Board James Hickey. Managing Director, LittleRock Pictures, Zoe Rocha, actor Ralf Little, Alan Marr, Roseanne Flynn of Element Pictures and BBC Development Editor Jonathan Lewsley. Sheila Tighe and Irish Film Board executive Sarah Dillon. Speech from Chief Executive of the Irish Film Board James Hickey. Chief Executive of the Irish Film Board James Hickey and Irish Film Festival London director Kelly O’Connor. Film-maker Tracy Spottiswoode with actor / producer Vaughan Sivell and Hannah Thomas of Film Agency Wales. Michael Chapman and wife Erica Chapman, both in film sales and acquisitions. Production manager Tricia Perrott, Bafta Award winning producer Ger O’Flynn and Emer O’Shea of Element Pictures. Emily Gotto of Protagonist Pictures (Acquisitions Executive) with Rory Gilmartin of the Irish Film Board and Camille McCurry of United Agents. 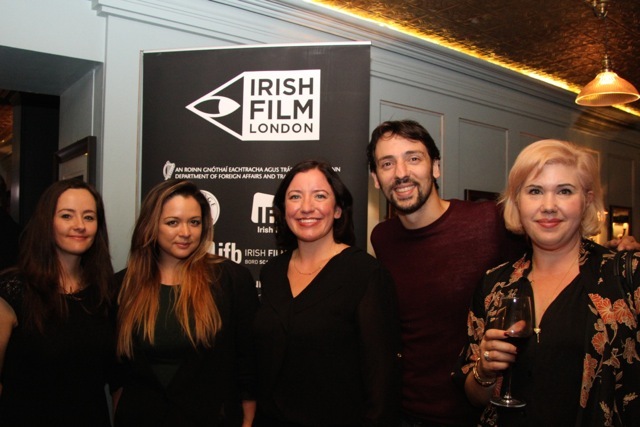 Irish Film Festival London director Kelly O’Connor, Managing Director, LittleRock Pictures, Zoe Rocha, Angela Sammon, actor Ralf Little and Charlotte Knight. 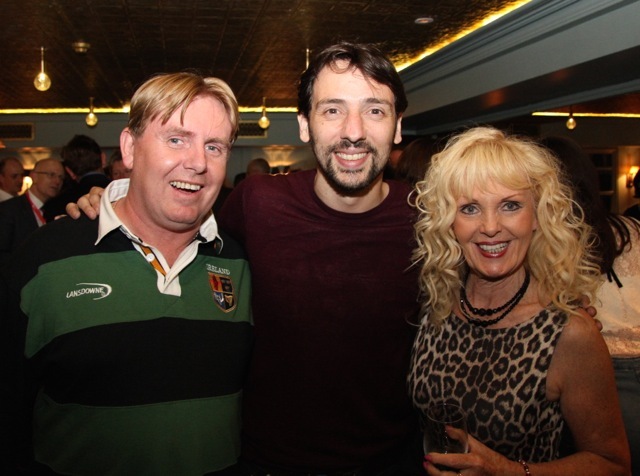 John Bowe of Irish TV with actor Ralf Little and Kathryn Bowe. Irish Ambassador Dan Mulhall and his wife Greta with director of Irish Film Festival London Kelly O’Connor (centre). BFI London Film Festival selects TEN Irish Films for their 2015 line-up!